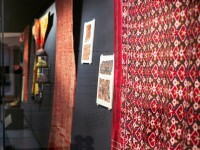 Explore the beauty and variety of Eastern Art objects on display in the Textiles gallery. The four repeating patterns illustrated here [EA1984.443, EA1984.329.a, EA1984.426, EA1984.435] provide us with a glimpse of some of the designs and stitches worked as narrow bands of decoration. The usual format for arranging bands of embroidery on square and rectangular cloths, as seen on the Newberry pieces, leaves the centre ground fabric plain and places three parallel bands along two opposite sides and one across each of the other two. However, two samplers in the collection show how patterns should be adjusted to turn corners, so it is clear that some embroideries did have continuous borders. The embroidery worked on the bands was sometimes very fine indeed; an example in the collection is even finer than that seen on No.60 [EA1984.329.a], where an interlace pattern has been carried out in stem stitch over a count of four threads on a cloth with a thread count of 36 to one centimetre. The patterns, colours and stitches illustrated here demonstrate the refined nature of this embroidery from the later period of Mamluk rule in Egypt. A narrow blue band with a dark blue border, filled alternately with white cartouches with black frames, and white horizontal S-shapes with black borders. The band is 1.5 cm wide. The patterning of the band is apparently done with needle-woven bars on drawn thread. Objects may have since been removed or replaced from a gallery. Click into an individual object record to confirm whether or not an object is currently on display. Our object location data is usually updated on a monthly basis, so contact the Jameel Study Centre if you are planning to visit the museum to see a particular Eastern Art object.